April 24, 2013 — For the past nine months, I have walked almost daily under the squint of a giant Muppet ninja. And while that might sound like the first sentence of the confession of a profoundly disturbed soul, I am not paranoid. The entire city of Boston can back me up. 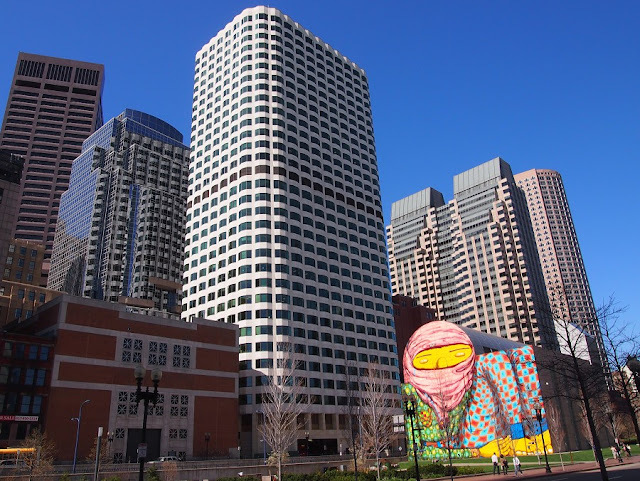 Right across from the main entrance of the massive transportation hub that is South Station is Dewey Square, a flat stretch of grass backed by a building-sized air intake structure for Boston’s underground highway. 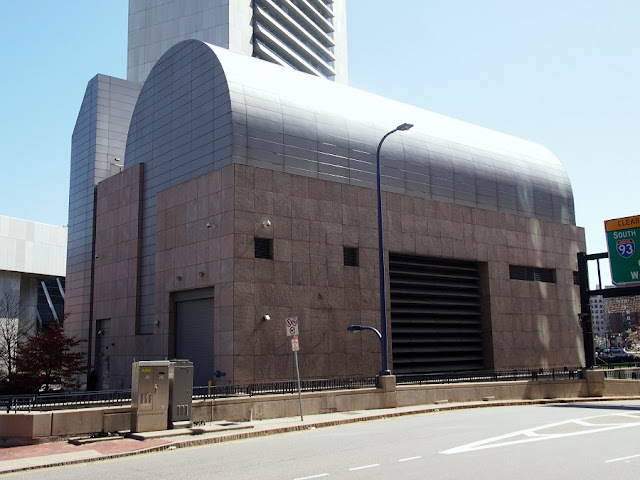 The side of the intake that faces the square is a flat, gridded wall with a hump on one side, hardly noticeably as anything but another vertical city plane. 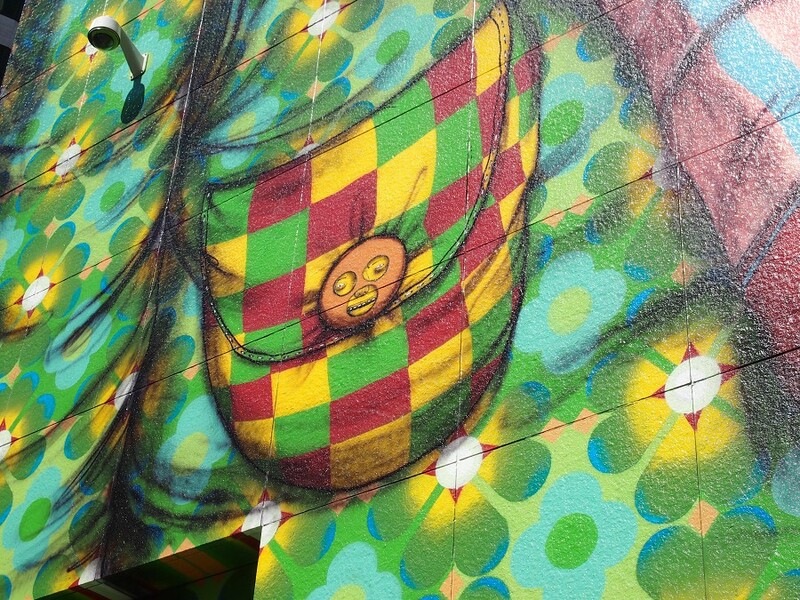 But where I’ve always seen a bland, urban shape against a background of bland, urban shapes, Os Gemeos saw a giant Muppet ninja. And that’s why they’re artists. 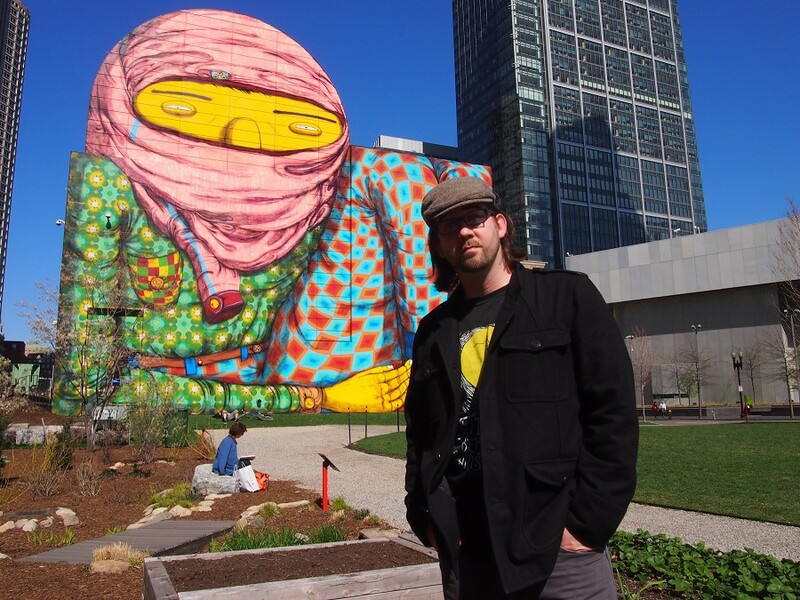 Os Gemeos (“The Twins”) is the collective name of Brazilian street artist/twin brothers Otavio and Gustavo Pandolfo. And the giant Muppet ninja is what they gave Boston when they were commissioned to paint a mural on this 70 X 70-foot surface as part of the opening of an exhibit of their art in Boston’s Institute of Contemporary Art. Technically, the mural is untitled, but that’s a void that obviously needs to be filled (giant Muppet ninja). The figure fits with their usual motif of large yellow-skinned people in colorful, contrasting getups. In this case, it’s a yellow-skinned, barefooted figure in a yellow and green flowered shirt and red, blue, and orange checked pants with a red jacket wrapped around his head so that only the band of his eyes shows through. He’s sitting with his arms around his knees and looks decidedly uncomfortable. Oh, and all of his buttons are yellow faces. It kind of gives the effect that he’s wedging himself in between the surrounding, and very gray, cityscape, a little bit ashamed (or defiant) for not wearing business attire or a Red Sox cap. Or both. This is Boston, after all. 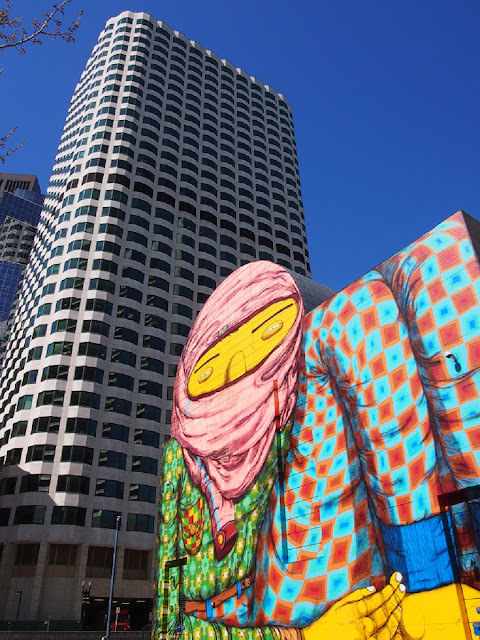 When this thing went up in August 2012, a lot of people thought it was inappropriately terrorist-looking. Others thought those people who thought it was inappropriately terrorist-looking were being inappropriately racist for interpreting the head cover that way. Both groups were inappropriately missing the point. Which is, naturally, that they had a giant Muppet ninja in their midst. It was obviously so because that outfit could only be camouflage on either Sesame Street or against the Electric Mayhem bus. 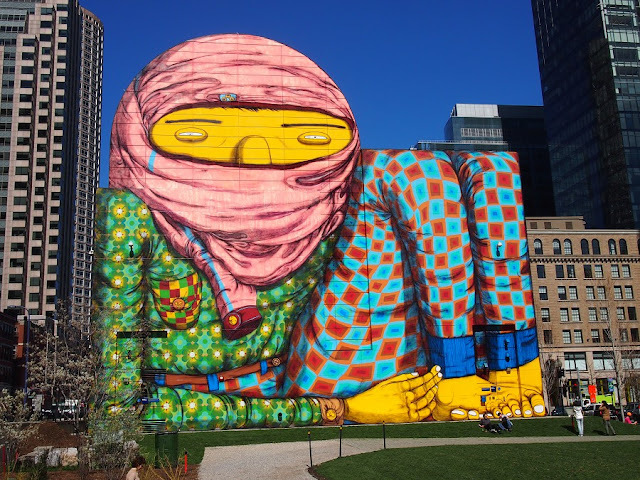 Of course, the artists say that they were just using one of their signature figures to brighten up boring Boston with a bit of their Brazilian flair. All I know is that I have to look at this guy almost every day, twice a day. He’s unavoidable. I’m not sure whether he makes my eyes sore or gives them a rest from the glass and metal cage that is the city. I guess I won’t know what I got ’til it’s gone. And it took me 25 years to finally see the wisdom of the band Cinderella. I think that makes the mural an official success. But it won’t be gone for a few more months. That Os Gemeos exhibit at the ICA is long since shuttered, but the mural is slated to stay until at least October of this year. But you know those giant Muppet ninjas. Completely unpredictable. Side and back of the air intake structure. UPDATE (09.12.2013): The giant Muppet ninja is no more. Back to being an air vent.